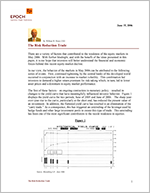 The Risk Reduction Trade - Epoch Investment Partners, Inc. There are a variety of factors that contributed to the weakness of the equity markets in May 2006. With further hindsight, and with the benefit of the ideas presented in this paper, it is our hope that investors will better understand the financial and economic forces behind this recent equity market decline. In our view, the behavior of the markets in May 2006 can be attributed to the following series of events. First, continued tightening by the central banks of the developed world occurred in conjunction with an increase in market volatility. This combination led investors to demand a higher return premium for risk-taking which, in turn, led to lower asset prices and a downturn in equity market performance. The first of these factors – an ongoing contraction in monetary policy – resulted in changes to the yield curve that have meaningfully influenced investor behavior. Figure 1 displays the yield curve for two periods, June of 2005 and June of 2006. The sharp year-over- year rise in the curve, particularly at the short end, has reduced the present value of an investment. In addition, the flattened yield curve has resulted in an elimination of the “carry trade.” As a consequence, this has triggered an unwinding of the leverage used by hedge funds and other large investment pools to create this type of trade. This unwinding has been one of the most significant contributors to the recent weakness in equities. The soft performance that we witnessed in May of 2006 can also be attributed to a sharp rise in volatility in the equity markets. According to the data presented in Figure 2, the CBOE Volatility Index® (VIX) has shown a fifty percent increase since the beginning of the year. To understand the effects of this volatility, we can refer to the basic theory of present value. According to the laws of investing, the present value of any investment will decline with increased uncertainty surrounding its expected outcome, even if that expected outcome – “the mean” in statistical terminology – remains unchanged. Add a dollop of inflation fear, continued uncertainty surrounding energy prices, a slow-down in consumer spending, and a decline in housing values that effectively closes the home ATM window, and one finds that investors become less willing to accept risk. In other words, the prevalent risks in today’s economy have caused investors to seek a higher return from equities, and that means lower equity prices. CBOE Volatility Index ® – The VIX measures market expectation of near term volatility conveyed by stock index option prices. As a result of the market’s increased volatility and the investor’s increased aversion to risk, certain investment vehicles have been hit particularly hard. Emerging market securities – both debt and equity – small cap stocks, and various derivative instruments that are affected by the availability of liquidity have recently underperformed and are unlikely to fully recover in the near future. This continued decline makes sense when one considers that returns on cash are currently at 5%, and history indicates that investors require an additional 5% premium on equity returns. Therefore, investors will need to see a 10% total return on equities. With dividend yields at less than 2%, will earnings growth make up the remaining 8%? If real economic growth slows in the quarters ahead, the answer is probably no. This means that May of 2006 may have been the harbinger of persistent weakness in certain segments of the equity markets. There are other market forces that may also come into play over the coming months. It is possible that the world may be further negatively impacted by a continuing widening of the U.S. deficits. Foreigners now own nearly 50% of U.S. securities (Figure 3). Will the dollar reflect the U.S. tendency to inflate away its obligations to other nations? Will the consumer slow his spending with rising energy prices and higher mortgage payments claiming larger and larger fractions of his paycheck? With all of these considerations in mind, the upcoming investment terrain is likely to present some very real challenges. How, then, can investors make the best choices for the present and future health of their investments? When answering this question, the important thing to keep in mind is that the recent risk premium adjustment, as seen in May of 2006, means lower P/E ratios. In several of our earlier papers, we have presented the argument that the P/E ratio has ceased to be a positive explanatory variable in the performance of today’s markets. This has never been more true than it is right now, particularly in the face of ongoing volatility and risk aversion on the part of investors. The wise investor, therefore, will not judge investment opportunities by their P/E ratios. P/Es will be neutral at best in the period ahead, which is the opposite of what investors experienced in the 1980-2000 period. Instead of looking to P/E for an indication of investment worthiness, today’s informed investor will seek companies that are most likely to use their strong operating cash flow prospects to raise dividends, buyback shares, or pay down debt. Alternatively, these companies may also re-invest internally and acquire firms where such actions are accretive to shareholder value. In our view, firms that follow the above-mentioned free cash flow deployment strategies are best positioned to protect and grow investor wealth through a time of increasing market volatility. By investing in these companies, preferably in the form of long-only portfolios with an absolute return orientation, investors can safeguard their capital, even during equity market conditions similar to those in May of 2006.